Although Mutch Katsonga, author of Where Wildfires Glow, classifies his book as a Young Adult/Coming of Age story, I’d be more inclined to describe it as a psychological thriller: the plot and one of the principle characters, Carol, are positively chilling! Furthermore, given the information supplied by the author on subjects like child abuse, and the long-term psychological effects on the victims, and what motivates people to kill or commit suicide, this book becomes much more than just a riveting story. The plot is complex and frightening! A 12-year-old boy is located in the woods after missing for months. How he has stayed alive through a freezing winter with no food is a story in itself. But it’s “why” he has been living alone in the woods that is the real story which will keep readers turning pages, feeling his pain as he is bullied and abused by the alcoholic Carol who looks after him after the father he loves is imprisoned. When Carol’s drinking gets out of control and the boy’s fear is so intense it brings on nightmares and suicidal thoughts, catastrophe results. Several young people end up dead. Did the boy kill them? 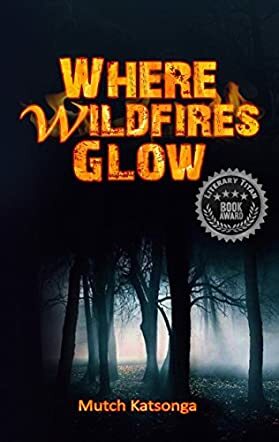 Read Where Wildfires Glow to find out. This is an ambitious book. Mutch Katsonga is involved in counselling and while he has written a gripping story, as I mentioned above, he is keen to educate the reader on the psychology of abuse. While this is interesting, readers might feel that the psychological analysis begins intruding on the story line. It might have been more effective to tell the entire story first, then have a Part Two to explore the reasons for Carol’s crazy behaviour and the psychological effects on the boy and his several “sisters” of what they experience under Carol’s care. That said, Where Wildfires Glow is worth your time. Enjoy!